Trail Guide to Learning is always discounted at Schoolhouse Publishing! What I think: I haven't had a chance to use Trail Guide to Learning yet (we won't be doing US history again until about 2015), but I've spent a lot of time looking through it and dreaming about using it. I am SO impressed! Though the price tag is expensive, you can teach all your kids in approximately 2-7 grade with one program that includes history, geography, science, language arts, and art. All you need to add is math. It is so well planned, with a day by day, page by page lesson plan/script. The projects are thoughtful and interesting. If you want to break away and do something more fun with your kids this year, but lack the confidence, this program may be just what you're looking for. Trail Guide to Learning by Debbie Strayer & Linda Fowler (Geography Matters): Did you ever want to break free of traditional teaching approaches but worry that you wouldn't do it right? 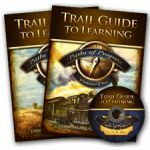 More than a curriculum, the Trail Guide to Learning series teaches you HOW to teach. Taken from the heart of Dr. Ruth Beechick's philosophy and personal mentoring, this curriculum not only guides you in what to teach, but how to make the most of these precious homeschooling years. Trail Guide to Learning uses real books, reading and writing for a reason, and activities that don’t just fill time and paper – but bring points home. Little teacher preparation time is needed because all the lessons are clearly laid out. Your students will create personal notebooks that double as portfolios to show what they have learned. • Set in motion the thinking skills that lead to comprehension and writing ability. • Increase science, history, literature and geography knowledge while establishing tool skills (reading, writing, listening, and speaking). • Use real books to provide key connections and motivate listening and reading. • Utilize Charlotte Mason’s philosophy of developing thinking skills naturally through observation and narration, while connecting subjects in a thought-provoking way. ﻿And of course, all this is discounted at Schoolhouse Publishing!